Tony and Lois have never been ones to sit around idly twiddling their thumbs. Tony served as a pastor for more than 40 years, even during his “so-called retirement”, while he and Lois were also active volunteers for other non-profit agencies in Fond du Lac. Together, they have led an active lifestyle with kids, grand kids and a committed exercise regimen. Five years ago, when Tony learned he had Parkinsons’ Disease, he didn’t let it slow him down. As Lois says, “Tony has always been a doer,” so he continued his exercising with Lois, took the prescribed medications by his physicians and went on with life as is. Over the past five years, as the disease progressed and eventually Tony began using a walker, his determination never ceased. “I never let it get me down. 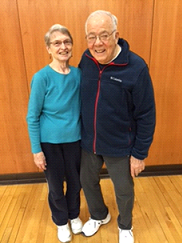 I’m not going to let Parkinson’s slow me down or take over my life.” So when he and Lois learned that the YMCA offered a Parkinson’s Exercise class, they joined the Y family together. Lois says, “We see the Y as a very positive place where we can do so many things. Silver Sneakers, walking class, Parkinson’s Class.” And it’s something they’re doing together.